The Great American Melodrama always feels like an extra special place during its annual tradition, the Holiday Extravaganza. The halls are decked, the piano sings with familiar songs, and the youth actors that make up the Cratchit family in A Christmas Carol lead you to your seat. That's how the Holiday Extravaganza always begins, with Charles Dickens' classic tale of Christmas cheer. The big cast starts with a haunting carol in a minor key—the first example of the pitch-perfect harmonies they will sing all night—as Ebenezer Scrooge (Beau Heckman) takes the stage. 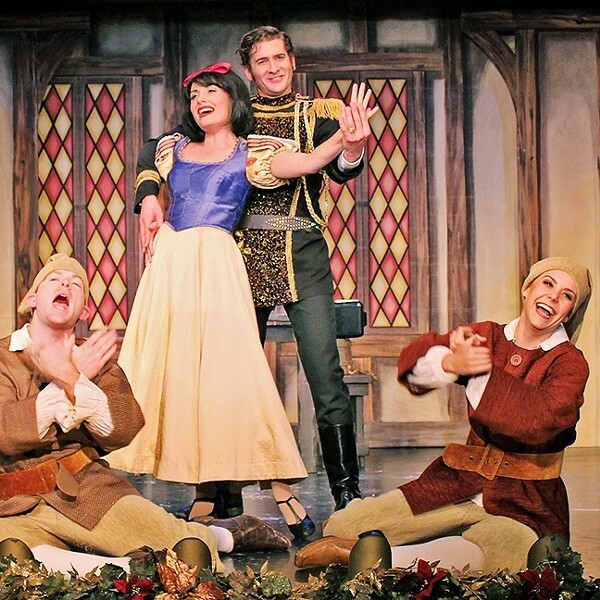 SINGING SNOW WHITE: The Great American Melodrama cast shines with comedy and musical prowess in the 'Snow White and the Four (Don’t Ask) Dwarves,' an operetta lampooning the classic Disney tale. Scrooge makes his way through the snowy English street, cursing at beggars with a steely scowl. Heckman is totally in the moment with his portrayal of the iconic old miser as he enters the character's business and begins harping on the only employee, Bob Cratchit (Jeff Salsbury). We see Scrooge shout away some Christian aid seekers (Paul Henry and Holly Halay), saying outright that the poor and hungry are better off dead. He also refuses to wish his own kin a "Merry Christmas" when visited by his nephew, Fred (Matt Miles). The old curmudgeon seems nothing but the villain in his own story. But then Scrooge goes home and gets a visit from the ghost of his late business partner, Jacob Marley (Mike Fiore), who warns of a torturous fate that he is cursed to, and that may befall Scrooge. The scene includes some impressive special effects and chilling musical accompaniment from music director Illana Atkins. Marley warns Scrooge that he will receive a visit from the ghosts of Christmas Past (Katie Worley Beck), Present (Henry), and Future (Miles). The supernatural characters take Scrooge on a whirlwind ride through his own life and the lives of those around him, showing him more than he ever hoped to see. 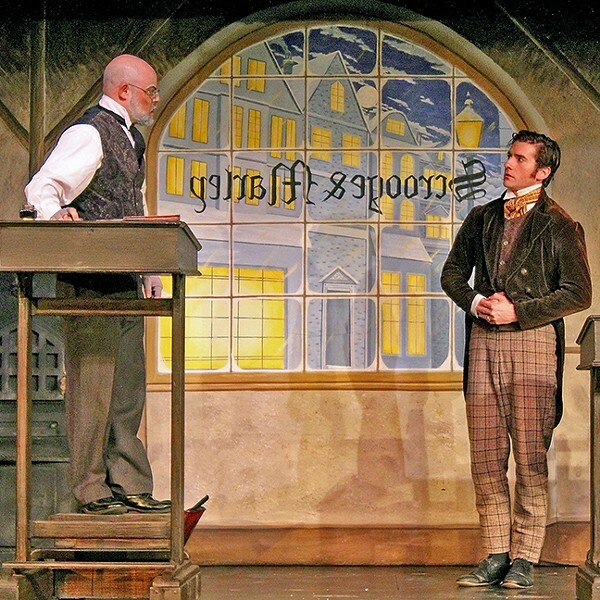 The talent of the Melodrama's cast—from its youngest members, like Tiny Tim (Jet Martin and Bennet Wittlieb), to the quick-change prowess of actors like Fiore, Henry, and Halay—is front and center in a one-act like A Christmas Carol. The second part of the three-part extravaganza is Snow White and the Four (Don't Ask) Dwarves, an operetta. The fairy tale parody is a quick break from the holiday theme, but boy does it deliver a serious dose of musical skill and hilarity. The story opens with most of the cast singing about the birth of Snow White to the tune of Beethoven's "Turkish March." The juxtaposition of classical musical with insanely funny slapstick is a thing to behold, and the cast relishes it. Then the familiar characters come into play, Snow White (Worley Beck), the Wicked Queen (Eleise Moore), her Magic Mirror (Heckman), the Huntsman (Henry), Prince Charming (Salsbury), and of course the four dwarves (Rachel Tietz, Henry, Miles, and Fiore). There's also the unfamiliar character, the Jester (Halay), who works from the inside to thwart the Wicked Queen's nefarious schemes. All together as an ensemble, the cast is incredible. They deliver a wall of sound when singing together, and their comedic timing is fine-tuned. Several actors get a chance to really shine on their own too, like Worley Beck, who owns the show with her powerful voice and hilarious portrayal. Salsbury is superbly funny as the hapless Prince, who gloats about doing all his own stunts but continually (and intentionally) bungles his entrances. CATCH THE SHOW: The Great American Melodrama presents its annual Holiday Extravaganza showing through Dec. 31 at the Melodrama, Highway 1, Oceano. Cost is $19 to $25. More info: 489-2499 or americanmelodrama.com. The evening always closes out with a vaudeville review at the Great American Melodrama, and the Holiday Vaudeville Review demonstrates that everyone on stage there is a triple threat of acting, singing, and dancing. Sun Arts Editor Joe Payne always feels the holiday cheer at the Great American Melodrama. Contact him at jpayne@santamariasun.com.